Swiss watch brand Artya presents its new watch collection inspired from lepidopterology, the hobby of collecting and painstakingly preserving the most beautiful flying organisms in the insect kingdom. To be kept safe under glass for observation. Inspired by this eons old hobby and passion, Artya offers their newest collection of piece unique watches to be officially presented at the GTE 2011 in Geneva. Just as in lepidopterology, Artya preserves the essence of a butterfly’s beauty under glass (in this instance sapphire crystal). Artful in their interpretation, Artya chose just the wings from various species of butterfly arranged in a collage of color. Artya hand-chooses individual wings from real insects for each piece unique watch (no harm being done as they are already post-mortem). The glistening reflection of each wing plays with the light resulting in one of the most unique wrist watch dials ever created. The arrangement and placement of butterfly wings on a watch dial is no simple task. 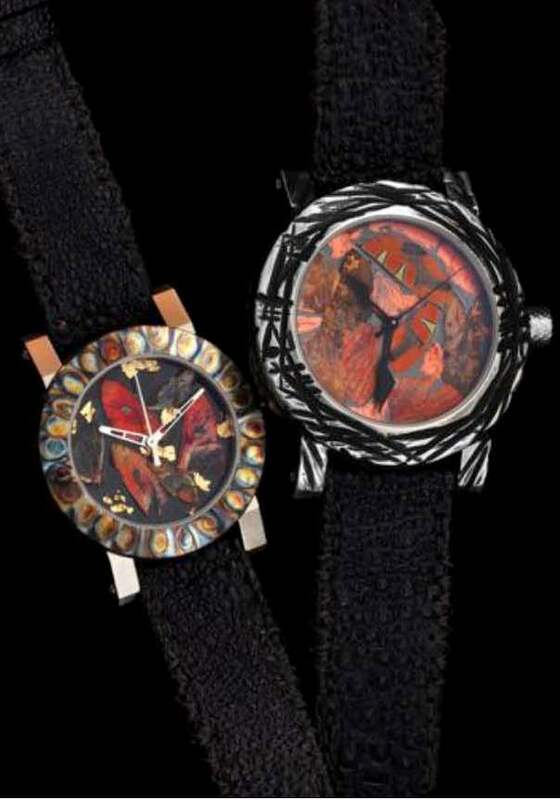 Artya needed to develop a special technique for the creation of the Artya Farfalla collection – “farfalla” meaning butterfly in Italian. Clients of course may be able to recommend the palettes Artya chooses in designing a Farfalla watch, as the animal kingdom contains butterfly wings of many tones. There is nothing obvious about the Artya Farfalla and its materials. The beauty of the concept is in its ability to remain relatively incognito. The unusual dial design does not necessarily readily announce itself as being made up of butterfly wings. This is especially true when the wings are mixed with other decorative elements such as gold leaf. Much of the time it is up to the wearer whether or not to disclose the entire story of the Farfalla watch. Artya Farfalla collection timepieces are each one-of-a-kind handmade creations, being housed in Artya’s “Coup de foudre” watch cases. Intended for ladies and gentlemen, the collection mixes the soft delicate nature of nature’s winged canvas, with the organic fiery intensity of the Coup de Foudre watch case.